Perfectly portioned, these .5 oz. cups of strawberry jam will deliver just the right amount of sweet and tangy flavor to your customers' dishes. 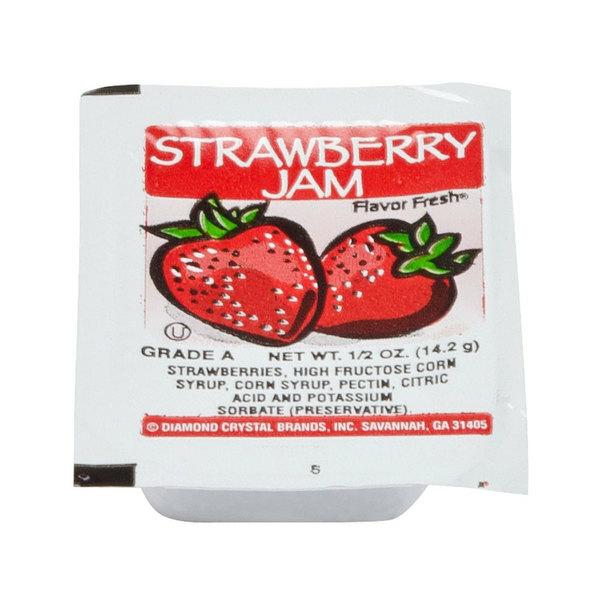 This delicious jam is ideal for any restaurant, diner, convenience store, cafeteria, or take-out station and offers a quick and easy way to enhance profitable menu items. 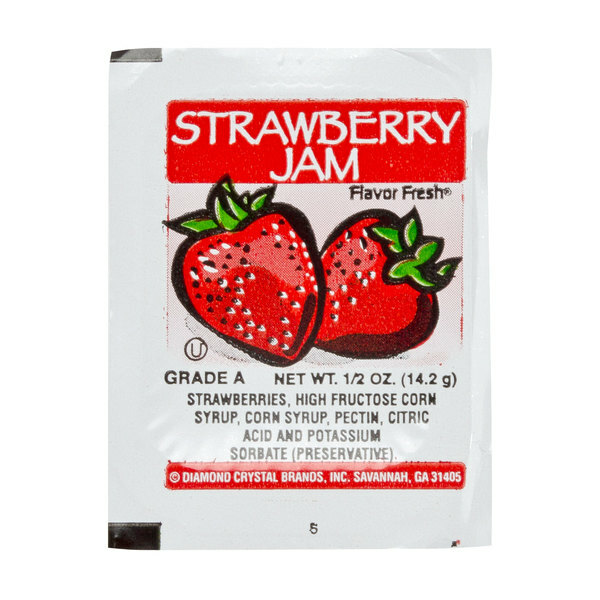 A brand you can trust to deliver premium jams, Flavor Fresh fills each portion control cup of strawberry jam with wholesome ingredients and freshly-picked fruit flavor. This sticky-sweet strawberry jam is the perfect complement to classic breakfast items such as bagels, toast, pancakes, waffles and more! Unlike jellies that are sweetened with juice, this strawberry jam is made from freshly crushed fruit and sweet syrups. Flavor Fresh strawberry jam is sure to enhance any breakfast dish with the delectably sweet and subtly tart taste of wholesome strawberries! The smooth texture and lush berry taste of this jam will add just the right amount of satisfying sweetness to your customers' food and is a must-have item for any establishment. The strawberry jam is delicious and we love the portion cups. A great way to serve it to lots of people quickly and easily. A great price per cup as well. A very well priced and affordable portion cup of strawberry jam. The jam tasted great and was a great addition to our breakfast fundraiser at work. This is a great, low cost alternative to other brands. It doesn't have an excessively sugary taste and the price is more than reasonable on Webstaurant. A very nice and sweet strawberry jam that is very reminiscent of my grandmother's recipe. The jam spreads well and is the perfect amount in each individual cup. A great find for our family. Tasty and super handy. We use these as a side for our Monte Cristo panini. We were buying jarred jam and scooping it into cups but these save us a ton of time. Pretty good jam, but not as good as others I've had but this serves the prupose well. Nice that they are individually portioned so it makes things easy. A great product at an affordable price. Our church serves these jam packets with bagels on Sunday mornings. The individual packages are very attractive and sanitary. This strawberry jam has a great tast. some customers request jam instead of jelly. great portion control at a great price. I have toast every morning and i like it to.